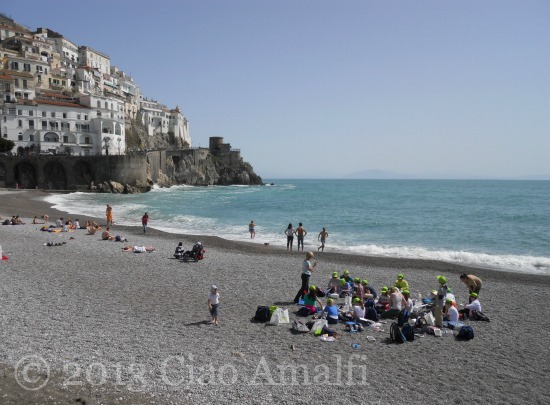 Palm Sunday arrived last weekend with some much needed sunshine for the Amalfi Coast. We opened the windows in the morning and sat up a small table nearby to enjoy the warmth of the sun during breakfast. After that there was only one thing to do … go and enjoy the sunshine and the holiday atmosphere in Amalfi! Easter is one of the most important holidays of the year in Italy, and you can really feel that it’s festival time, especially when the weather is nice. A storm had just passed the night before and the sea was still rough with that bright turquoise color that comes with bad weather. But in Piazza Duomo it was all sunshine! With all the bad weather the season has been slow getting started, but there were those first signs of the busy season already in the piazza. 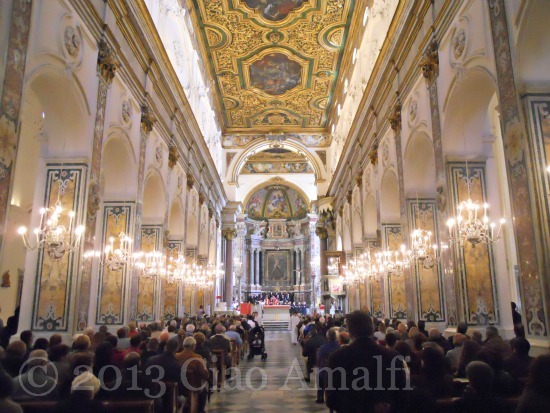 We climbed the stairs to see the Palm Sunday mass in the Duomo of Amalfi, which was standing room only. Outside it felt like spring had finally arrived! The beach had a few families and brave souls wading into the rough water. There was a school group of kids from the UK and they all seemed busy drawing away on notepads. What a beautiful spot for an artistic moment! The sunshine really was glorious and has been sorely missed this spring. You could feel the energy that the sun added to the lively Sunday morning atmosphere. 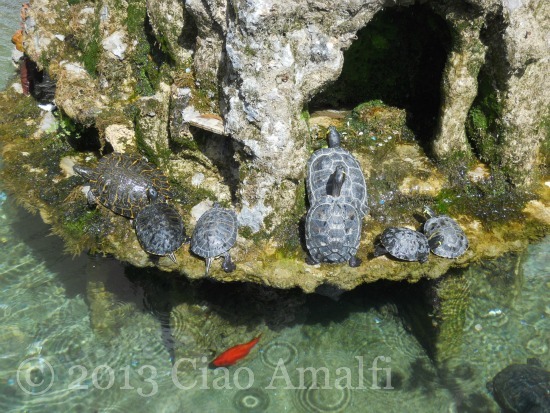 Even the turtles in the fountain in Largo Scario were piled up enjoying the warmth of the sun! Everyone ... even the turtles ... enjoying the sun! We took a leisurely walk along the port to the pier were we spotted some rather desperate sunbathers who had found a warm spot to enjoy the sun. Behind the port it was protected from the breeze, and they had the entire area to themselves. Where there’s a will there’s a way! After another rainy week, the sun is out again today. We’re all willing that spring will finally come and we can dry out from a very rainy and cold winter on the Amalfi Coast. That reminds me … I’d better dig out my swimsuit! Things have been pretty quiet around here on Ciao Amalfi lately, and I apologize for the lack of updates! 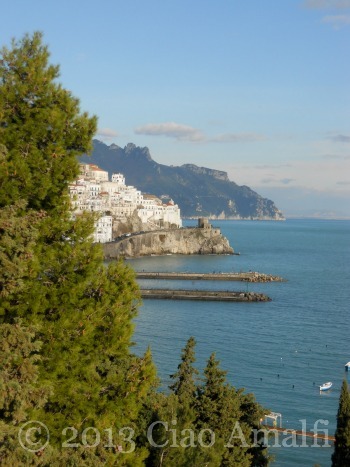 In some ways it’s quite natural as life slows down this time of year to savor a bit of quiet on the Amalfi Coast. After the buzz and celebrations of the holidays, the rest of January and February are very quiet months around here. This is the time of year to rest, enjoy a bit of holiday time and to mentally and physically prepare for the busy season ahead. Easter comes early this year at the end of March, which is usually the kick-off to the holiday season on the Amalfi Coast. 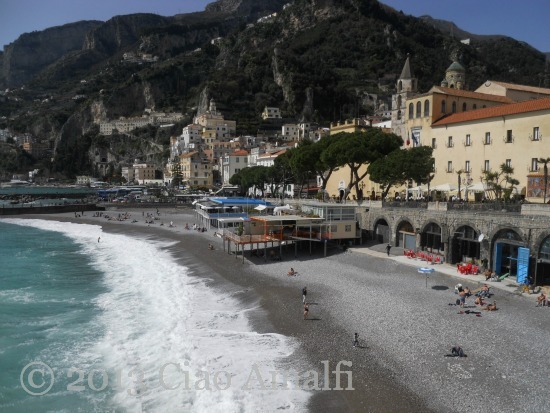 As the weather improves and beckons me out with my camera again, there will be more life and activity on Ciao Amalfi. 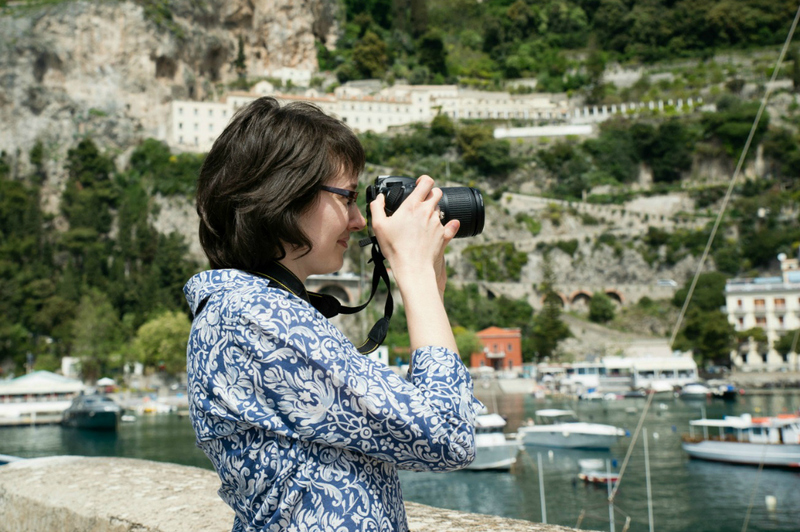 The new season is coming … and with it sunny days, lots to do and all the beauty of the Amalfi Coast to enjoy!